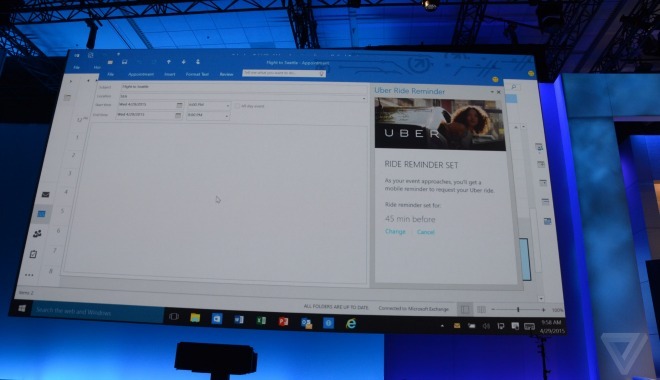 An Uber app running inside Outlook was demoed, as evidenced by the shot above. The Uber app or add-in doesn’t seem to intrude very much into the main Outlook workspace, but it will allow you to easily schedule rides from your calendar appointments. There are many other use cases for such add-ins for Office apps, of course, and Microsoft also showcased ones developed by LinkedIn and Salesforce. Interested developers will get access to the necessary tools for building these add-ins over the coming months. While Office has supported add-ins in the past, the APIs were on an individual app level. This time around, you write such an app once, and then it will run in all the Office apps, and across all the platforms which have Office apps.